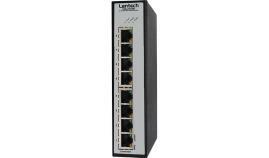 The Lantech IES-2307CFR is a 7-Port 10/100Base-TX + 3 10/100/1000T with 100/1000 SFP Combo Industrial Switch with SNMP functionality. The SNMP features are including QoS for 4 queues, 802.1q VLAN, IPV6, IGMP snooping and query, SSH/SSL, as well as SNTP and SMTP etc. 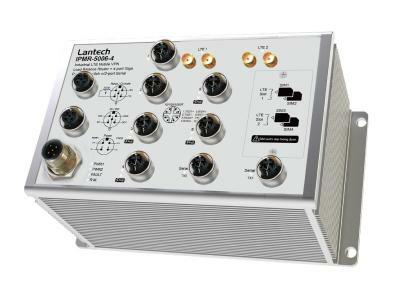 The Lantech IES-2307CFR supports Pro-Ring (Legacy-Ring) and Pro-Ring II system. Pro-Ring(Legacy-Ring), an auto-recovery path within 10ms up to 250 Lantech Industrial Switches; Pro-Ring II is a new Ring mechanism for Lantech Industrial Switches in which it eliminates the need to pre-set the Master switch in previous Pro-Ring and yet to protect the network by much secure topologies than ever. It works as a Ring Chain to reduce the risk of master switch linking down whereas the setup becomes much easier. Pro-Ring II can be backward compatible with old Pro-Ring by down-grading the Ring scheme to old one. The IES-2307CFR DIDO function can support additional open/close physical contact for designate applications besides Port / Power events, for example, DIDO function can trigger alarm if the switch was moved or stolen. In case of events, the IES-2307CFR will immediately send an email to pre-defined addresses as well as SNMP Traps out. It provides 2DI and 2DO while disconnection of the specific port was detected; DO will activate the signal LED to alarm. DI can integrate the sensors into the auto alarm system and transfer the alarm information to IP network with email and SNMP. 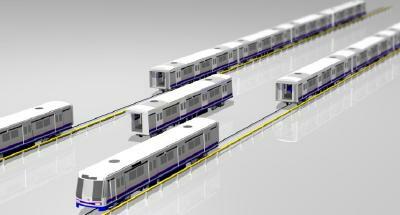 Besides, IES-2307CFR built-in hardware bypass function avoiding two or more nodes power fail in a ring or bus structure. The internal bypass circuit connects these two ports and make Ethernet ride through the switches that lost power to operate. With Bypass redundant technology, all switches can connect via bypass path without interrupting even power failure occurs. 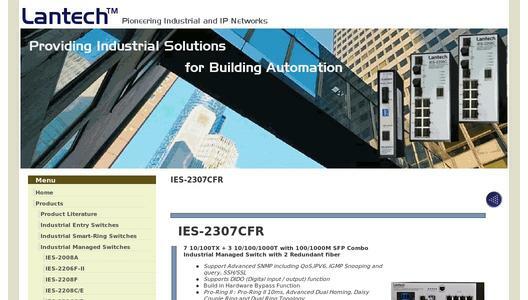 The IES-2307CFR is designed to meet with critical network environment with IP 30 enclosure and test under extensive Industrial EMI and Safety standards. With wide temperature from -40°C~60°C, It is suitable for surveillance, factory automation, transportation, telecom / ISP outside terminal, heavy industrial factory and other factory assembly lines.